Run by Sustrans and funded by the Scottish Government, the competition delivers pioneering and game-changing projects which inspire public bodies in Scotland to design better places and spaces for people to live, walk and cycle in for everyday journeys. After an intensive three-stage process all five short-listed projects will be awarded a grant of up to 50% of the total project costs, with the grants totalling £22,540,360, from Transport Scotland funds, delivered through Sustrans Scotland. Each project is expected to begin development within the next two months, with Inverness City Active Travel Network (Highland Council) forecast to be complete by Summer 2020; Walk, Cycle, Live (Stirling Council) and Woodside Mini-Holland (Glasgow City Council) by Summer 2021. Both Meadows to George Street and the West Edinburgh Active Travel Network (Edinburgh City Council) are forecast to be complete by Summer 2022. CLPLUS is demonstrating that designing places around the needs of people delivers a wide range of benefits, including boosting local economies, supporting smaller retailers, healthier communities and safer, more attractive streets. Minister for Transport Humza Yousaf said: “I am delighted to announce this morning that all five Community Links PLUS shortlisted projects have been successful in securing funding from the Scottish Government. “The expert panel who evaluated the bids were impressed by the local authorities’ high level of design and innovation. Each bid is entirely worthy of receiving support today and I want to thank the panel, Sustrans and each local authority who took the time to get involved in the award. “Our ambitious Active Nation initiative is designed to encourage many more of us to make everyday and leisure journeys sustainably – on foot and by bike. To achieve this vision, we are doubling our investment in active travel, from £40 to £80 million each year, demonstrating our commitment to make our towns and cities more walking and cycling friendly. Environment Secretary Roseanna Cunningham said: “Climate Week is an opportunity to get more people talking about and taking action on climate change, and I am pleased to be supporting the Community Links Plus active travel project, enabling more people to walk and cycle more often. 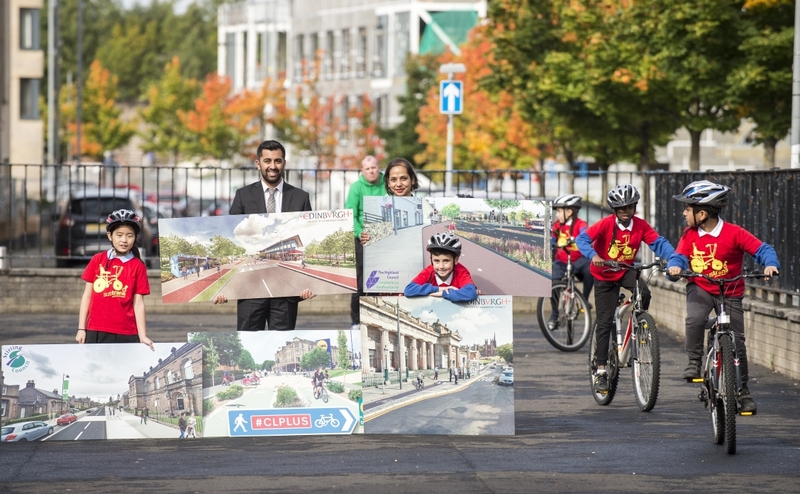 Sustrans Scotland Deputy Director for Built Environment Daisy Narayanan said: “Funding all five final projects is a bold step towards a healthier, more sustainable and vibrant Scotland which designs places around the needs of people over vehicular access. “The Community Links PLUS proposals were so impressive this year that the panel felt strongly that all the five final proposals should become a reality. We thank the Minster for Transport and the Islands for taking the unprecedented step of committing to fund each of the five finalists.